Выпуск данной серии начался с самолета Martinsyde F.1, большого двухместного биплана с размещением членов экипажа тандемом в открытой кабине. Самолет предполагалось использовать как истребитель, но летчика разместили в задней кабине, а наблюдателя - в передней. ДальшеMore>>> В результате наблюдатель закрывал летчику обзор и мешал прицеливанию при ведении огня из фиксированных пулеметов, а летчик сокращал сектор стрельбы из турельного пулемета наблюдателя. Построили всего два F.1, каждый с мотором Rolls-Royce мощностью 250 л. с. Судьба самолета была очевидной еще до начала официальных испытаний, вооружение на эти F.1 не ставилось. Следующим в данной серии стал единственный экземпляр самолета F.2. Это был более компактный по сравнению с F.1 двухместный биплан с 200-сильным мотором Hispano-Suiza. Самолет выдержал летные испытания, но в серию не передавался. Летчик на F.2 размещался перед наблюдателем, что логично, но и тут обзор летчику был сильно ограничен стойками и центропланами верхнего и нижнего крыльев. Towards the end of 1916 yet another type was designed and built at the Martinsyde works. This machine was fitted with a 190 h.p. Rolls-Royce engine. Although retaining the unmistakable Martinsyde appearance, this machine was altered in several respects compared with the "Elephant." For instance, the radiator, which in the G.100 was placed behind the engine, was in the new machine placed in the nose, car fashion. Also the deck of the fuselage was considerably higher, especially behind the pilot. Two machine-guns were mounted on top of the deck for'ard, and were operated by synchronising gear. The machine passed its official tests at Farnborough in February, 1917. Considering the date - early 1917 - her performance was most excellent. At ground level the speed was 130 m.p.h., at 10,000 ft. 122 m.p.h. while at 18,000 ft. she still did 108 m.p.h. The climb was equally good, 19,000 ft. being reached in 30 mins. 55 sees. The R.G. was used as a fast single-seater fighting scout. The manoeuvrability was excellent, and of innovations, other than those already referred to, may be mentioned the fitting of a trimming tail. The range, it will be seen, was large - 585 miles. We now come to the first of the F. series. This machine went through its tests in the summer of 1917. It was known in the works as "Father," being the first of the F. type. It was a two-seater machine, fitted with a 250 h.p. Rolls-Royce engine. The gunner sat in front and the pilot behind. The wing surface was large, nearly 600 sq. ft., and the machine had a surplus lifting capacity of about half a ton. The figures of performance given in the accompanying tables relate to the machine with this extra load on board. Unfortunately no drawings are available showing the general arrangement of "Father," but a fairly good idea may be obtained from the accompanying photograph. The main difference in general arrangement which was noticeable in this machine was the arrangement of the lower plane. Instead of attaching direct to the body, the two halves of the lower plane were carried on short stumps projecting down from the lower longerons, as shown in the photograph. One would imagine that for present-day commercial use this machine would make a very good mail ‘plane, there being ample room in the front cockpit, which is reached through a rectangular opening in the top centre section. This would facilitate the loading and unloading of mail bags, etc., while at the same time the speed of the machine - 100 m.p.h. at 10,000 ft. - is quite sufficient for modern commercial requirements. 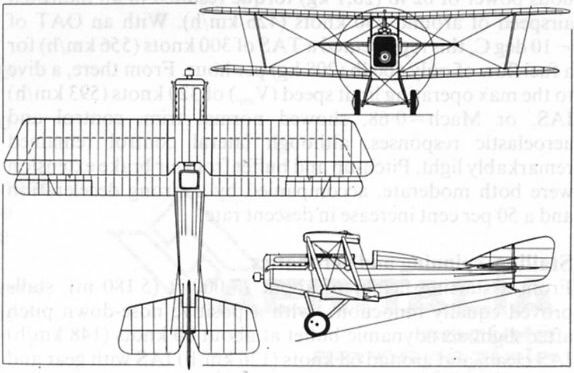 This machine, also a two-seater fighter, was an improvement on "Father," because of its increased speed and lighter construction. It was designed and built during the construction of F.1. The engine fitted was a 200 h.p. Hispano-Suiza, and the machine carried, in addition to fuel and oil, a load of about 1/4 ton. At the time of the tests the weight of the machine with full load was 2,355 lbs. The machine had a very low landing-speed, got "unstuck" after a very short run, and was very easy to fly, having a great amount of natural stability. На Martinsyde F.1 летчик сидел за наблюдателем, такое размещение членов экипажа сложно назвать удачным. 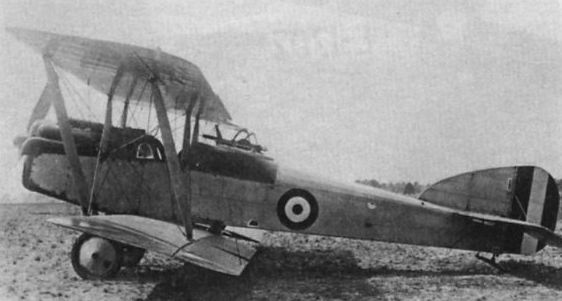 The prototype F.2 which entered flight test before the F.1. The Martinsyde R.G. which, in some respects, was an evolutionary development of the Elephant and was discontinued in favour of the F.3 Buzzard.